President Director of PT Pelindo IV, Doso Agung, said that the company continued to boost connectivity as an effort to support the Sea Toll program. Especially in Papua, he continued, connectivity built by Pelindo IV was good enough. So far, it is claimed that the Papuan community can already export directly to 54 countries. Doso revealed connectivity in the Sea Toll program initiated by President Joko Widodo proved to increase competitiveness and productivity. Not only that, he mentioned the cost of a number of strategic commodities in Papua was much cheaper than before. After all, the connectivity has also proven to reduce economic costs in Eastern Indonesia. "Connectivity has now been felt and proven to be able to strengthen food security by ensuring the availability of basic needs, affordability and price stability, and the quality of goods," said Doso, after a guest lecturer at Cendrawasih Papua University, in a written statement on (10/30/2017). According to Doso, Eastern Indonesia has great potential to continue to grow because it is supported by abundant natural resources. There are several leading commodities in Eastern Indonesia which always become the mainstay commodity. Among them are rice, cooking oil, cement, and sugar. In his course material at Cendrawasih Papua University, Doso also explained five executions of national priority programs by SOEs. Starting from connectivity, energy security, electrification, food security, and banking and financial services. 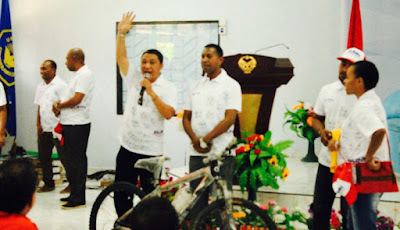 "Pelindo IV itself is given the task by the government to succeed Nawacita and Tol programs," he said. In the event, Pelindo IV also gave prizes of Rp1 million for savings of 15 students who can answer questions. In addition there are other presentations in the form of laptops, bicycles, development assistance of security posts, and study benches from a number of state-owned companies such as PT Pelindo IV, PT Danareksa, and Indonesian Trading Company (PPI). The SOEs present for the campus aims to increase understanding to the academic community about the national economic condition and the strategic role of SOEs in national economic development as well as to improve the link and match between state-owned society and universities.